Title: One of the most important questions with regard to science in the contemporary world is what is the relationship between science and meaning. 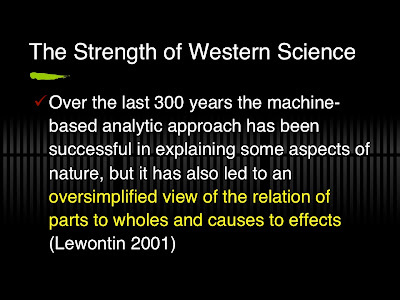 Science as practiced tends to ignore metaphysics and epistemology and count primarily on logic. One consequence of this has been a narrow definition of scientific ethics, which suggests that we should not interfere with research, even if the way it is carried out can be troubling. For Indigenous peoples this came to head over issues like NAGPRA and repatriation where “research” was being done on Indigenous peoples and their cultures as if they were only relics of a time that was past. 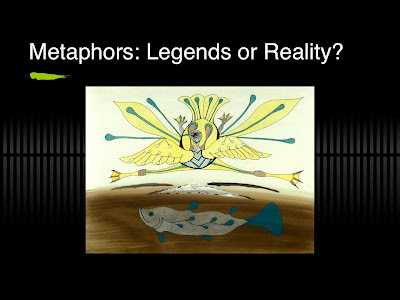 Slide 2: One way in which indigenous knowledge has been denigrated was the implication that the knowledge base it illustrated consisted of fairy tales or legends, because they were presented in metaphoric fashion through stories. 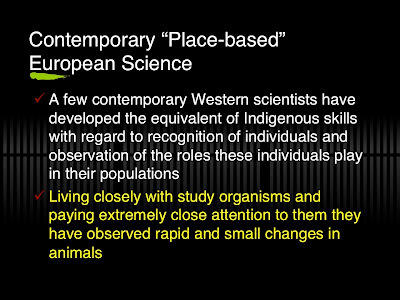 This response was shown by both “scientists” (naturalists) and religious practitioners, so the message sent was that Indigenous peoples were “primitive”, and that their knowledge could be dismissed. 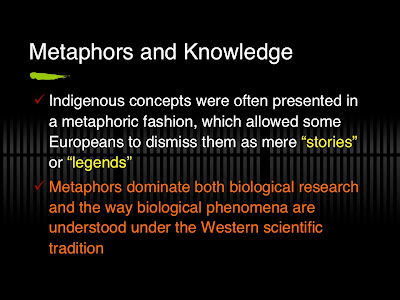 What went unrecognized is that both Western science and religion also depend heavily on metaphors to explain their own perceptions, e.g. DNA as a ladder or code, or communion as the body and blood of the savior. 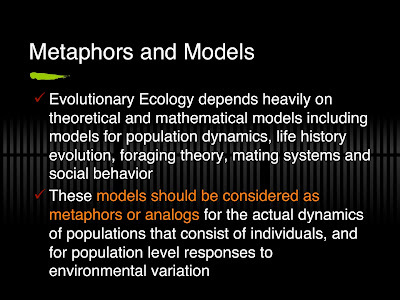 Slide 4: Evolutionary Ecology is one area where the goal is to understand how organisms are shaped by their environments. This discipline relies upon the use of models tends to dominate the way in which phenomena are studied, even though it is rarely discussed that the models are in fact metaphorical redescriptions of phenomena that occur in the real world. 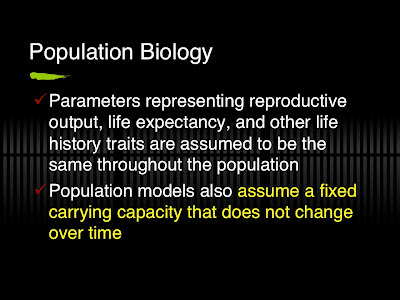 Slide 5: This is particularly true with regard to attempts to understand phenomena that occur at the population level such as life history evolution and natural selection. Such approaches often assume that the environment is constant and exists in a stable equilibrium. Some have argued that Evolutionary Ecology must be basically a study of theory rather than reality. Sources: Bulmer, M. 1994. 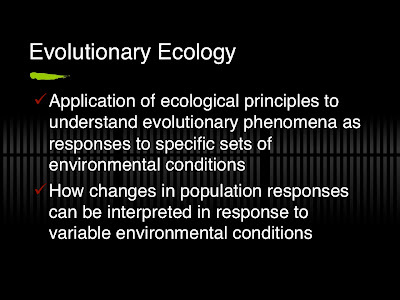 Theoretical evolutionary ecology. Sinauer Associates Sunderland, MA. Hoffman, A.A. and P.A. Parsons. 1997. Extreme Environmental Change and Evolution. Cambridge University Press. NY, NY. Houston, A.I. and J.M. McNamara. 1999. Models of Adaptive Behaviour: An Approach Based on State. Cambridge University Press, Cambridge, UK; Stearns, S.C. 1992. The Evolution of Life Histories. Oxford University Press, New York, NY. 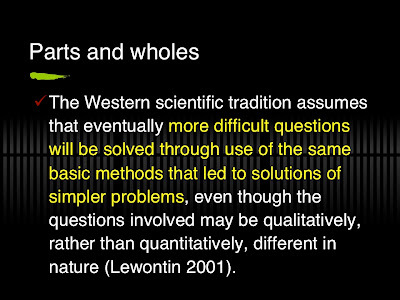 Slide 10: The nature of such problems can be seen in this quote from E.O. Wilson, founder of the science of Sociobiology and a person who writes extensively on the evolution of behavior, conservation, and evolutionary ethics. 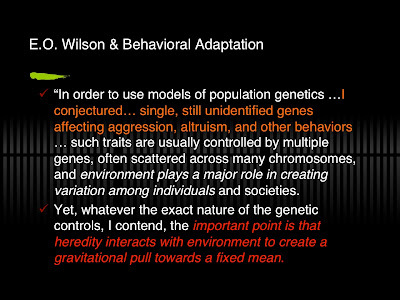 Wilson takes a very mechanistic approach to dealing with such issues and even though he acknowledges that environments are important in producing variation, he assumes that selection will tend to pull a group of variables towards a a fixed (consistent) mean. This is basically a Balance of nature argument tricked out in new language to argue that nature is constant and comprehensible through its tendency to return to the same state. Source: Wilson, E.O. 1998. Consilience: The Unity of Knowledge. Alfred Knopf Press, New York, NY. 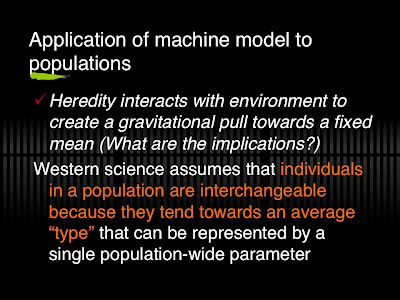 Slide 11: A major difficulty with this line of thinking is that even while envisioning variation it seems to assume that variation is not really important and that almost all individuals in a population will be mean = average and that this average phenotype will be favored by selection. This thinking harkens back to an even older scientific metaphor, i.e. the Platonic Ideal and the tyranny of the typical (average). Source: Pierotti, R. 2011. 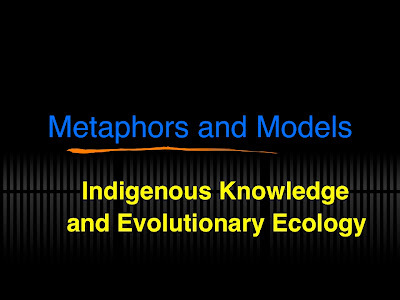 Indigenous Knowledge, Ecology, and Evolutionary Biology. Routledge. 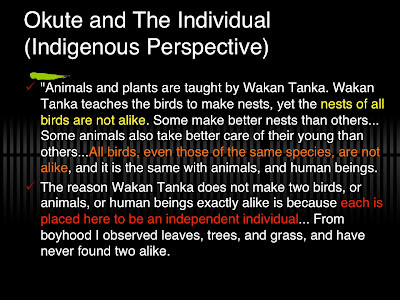 Slide 12: This line of thinking assumes that a population can be characterized through looking at “typical” individuals, which represent the result of natural selection. There is often an accompanying assumption of a “carrying Capacity, i.e. a population size where births equal deaths and the population size and the environment do not change. Thus we have linked the Platonic ideal to the Balance of Nature. This type of thinking dominates both conservation biology and wildlife and fisheries management in the western tradition, e.g. in models to characterize Maximum Sustainable Yield (MSY), even if such influences are not often acknowledged. 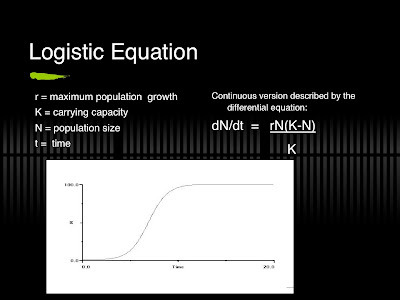 Slide 14: This is the logistic model, which should be familiar to anyone who has taken a basic course in Ecology. The far left portion of the curve represents the portion where reproduction is favored over survival (r selection) and this condition is presumed to exist to the midpoint on the curve, at which the rate of population growth (N) should slow down, indicating that intraspecific competition is becoming more important. Where the curve reaches an asymptote at K (=100 in this figure), competition should dominate and survival tactics are favored over reproduction. 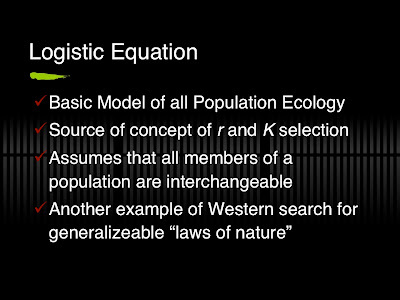 The origins of r and K theory were developed by Robert MacArthur, who assumed that this scenario described the change in conditions experienced by a single species population as it progressed from invading an empty habitat until it had fully occupied the habitat. For more detail see Boyce, M.S. 1984. 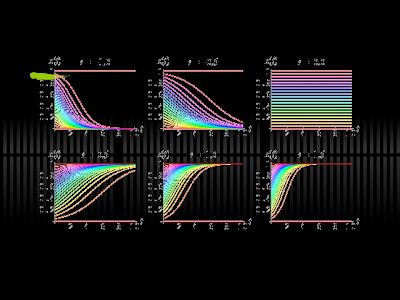 Restitution of r and K selection as a model of density dependent natural selection. Annual Review of Ecology and Systematics 15:427-447. 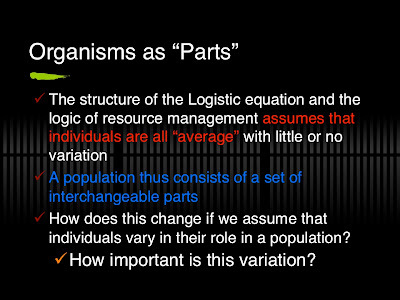 Slide 16: The usefulness and realism of the logistic model starts to fall apart if we consider that a population consists of variable individuals, each of which varies in ability to amass or control resources. It is important to keep in mind that all models use simplifying assumptions and a key assumption of the logistic model is that all members of the population are equivalent. This would not be a problem if the model were simply treated as a heuristic tool that provides a metaphoric image of how a population might function. The problems arise when this model is treated as if it illustrated reality, as in MSY approaches to fisheries management. 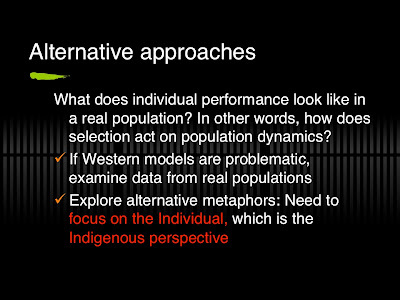 This problem has been widely recognized, yet the Logistic Model is still taught in many basic ecology courses without qualification, yet it no more represents reality that does a traditional tribal story about how hunting traditions were established, such as White Buffalo Calf Woman. 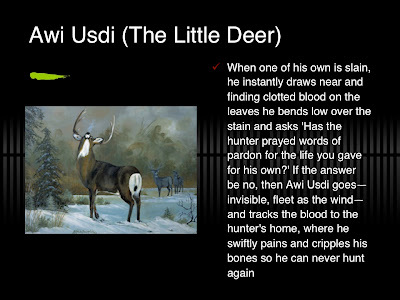 Slide 17: This illustrates a “story” as told by a Lakota around the beginning of the 20th Century. In the book where it is found it is described as speaking “about holy beliefs” and “that his people believed in a mysterious power”. Any ecologist or evolutionary biologist could just as easily describe this as a basic lecture about how variation among individuals influences evolutionary ecology. Source: McLuhan, T.C. 1971. Touch the Earth: a Self-portrait of Indian Existence. Promontory Press, New York, NY. 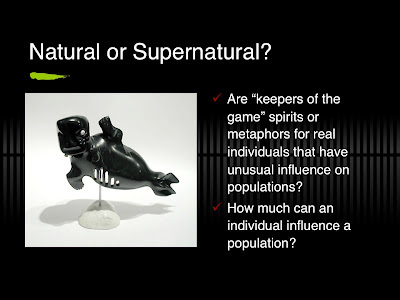 Slide 18: In recent years Western science has been paying more attention to individual organisms and to the amount of variation that exists among organisms in a population. 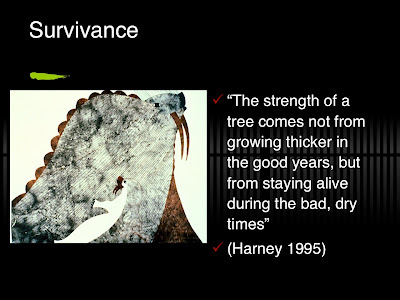 There are a number of ways in which individuals can vary and each of these is probably important in understanding its chances of survival and successful reproduction, which are crucial to understanding appropriate hunting strategies and the significance of any specific individual to a population. Slide 19: The nature of actual responses to environmental variation are subtle and not obvious at first. These responses seem to relate to changes in overall conditions rather than to simple variable like temperature. 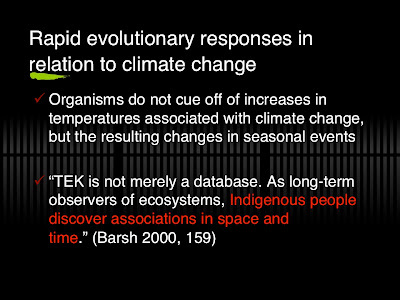 These changes are the sort of associations noted by Indigenous people rather than predicted by the models generated by Western science. Source: Hoffman, A.A. and P.A. Parsons. 1997. Extreme Environmental Change and Evolution. Cambridge University Press. NY, NY. Barsh, R.L. 2000. Taking Indigenous science seriously. Pp. 152-173 in S. A. Bocking (ed.). Biodiversity in Canada: Ecology, Ideas, and Action. Broadview Press, Toronto, ON, Canada. 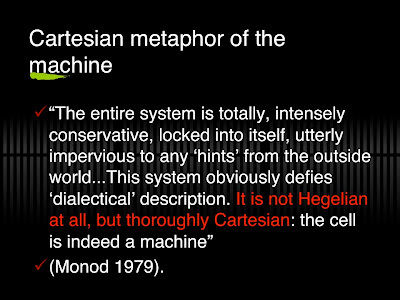 Slide 21: Thus the concept of creator, which Western thinking typically assumes must be similar or identical to the western conception of God actually describes a continuous process that results from dynamic interactions between species and the physical world. 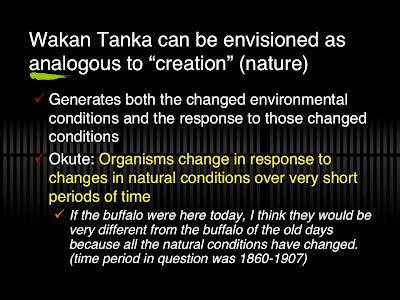 This process never stops, which is why Okute is so insightful in assuming that changing conditions would produce changes in species like Bison. 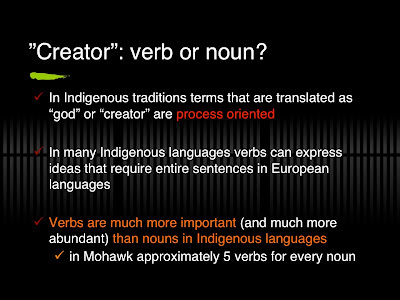 The term Creator has little meaning, the actual comparison should be to the process of creation which could be both a noun (outcome) and a verb (process). Slide 22: In the 21st century, it is more permissible to speak of emotions and even of passions in animals, but this is a very recent development, only a few decades old. Jane Goodall was one of the pioneers of this field, but another excellent and insightful student of animal behavior, Marc Bekoff of the University of Colorado, pioneered the field of what he calls “cognitive ethology” (Bekoff 2000, 2002, 2006, 2007). 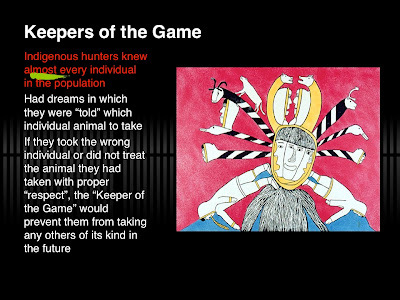 Bekoff’s work is particularly important for two reasons: 1) he has emphasized the importance of recognizing mind and emotion in nonhumans, and 2) he explicitly links such insights to the intellectual and scientific traditions of Indigenous peoples. Goodall and Bekoff have even worked together to produce books that emphasize these points (e.g. Goodall and Bekoff 2003). The excellent observer Franz De Waal has established that animals know right from wrong, and have political dynamics, and learn by carefully observing one another (de Waal 1995, 2001, 2009; de Waal and Tyack 2003). 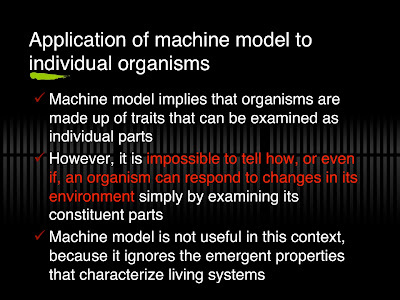 Slide 25: An issue has arisen in Western science between two major approaches to understanding organisms and the variation that occurs among individuals within a population, because evolution focuses on variation but ecology and systematics focus on similarity (Platonic types). Indigenous approaches can resolve this issue because they always focus on processes involving individuals. 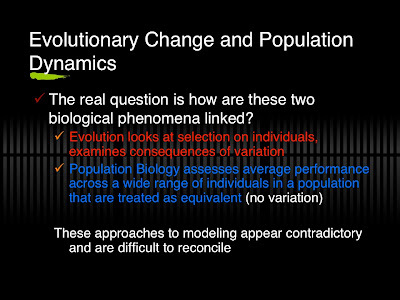 Slide 26: If we focus on how real individuals function within populations this could allow us to understand evolutionary change and how this impacts the dynamics of real populations. 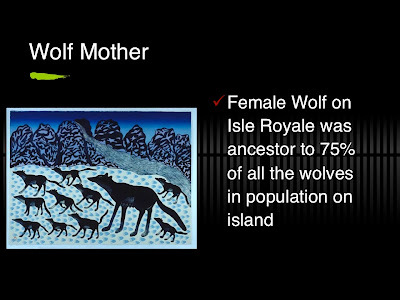 Slide 29: This is one of the major stories of the Cherokee People. Source: Awiakta, M. 1993. Selu: Seeking the Corn Mother’s Wisdom. Fulcrum Publishing, Golden, CO. "No hunter who has regard for his health ever fails to ask pardon of the deer for taking its life" (Martin, J. W. 2000. The Land Looks After Us: a History of Native American Religion. Oxford University Press, New York, NY. page 36). Such stories represent both instruction in how to hunt properly, so as not to overexploit key resources, and also that handling a killed deer carelessly can lead to disease that cripples, e.g. Lyme disease from deer ticks. 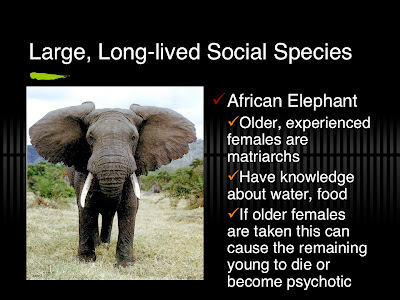 Slide 32: As with elephants investigators studying whale populations have learned the importance of extraordinary individuals, who serve as repositories of knowledge for their entire clans, and their loss has damaged the basic social functioning of groups.. Source: Whitehead, H. 1998. Cultural selection and genetic diversity in matrilineal whales. Science 282:1708-1711. Whitehead, H. 2003a. 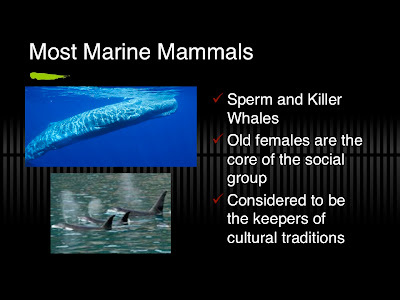 Society and culture in the deep and open ocean: The sperm whale and other cetaceans. Pp. 444-464 in F. B de Waal and P.L. Tyack. 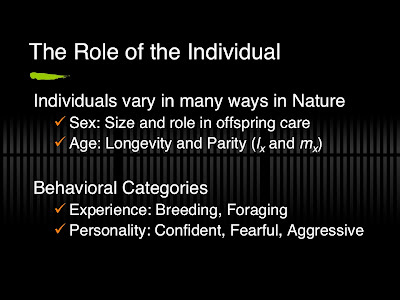 Animal Social Complexity: Intelligence, Culture and Individualized Societies. Harvard University Press, Cambridge, MA. Whitehead, H. 2003b. Sperm Whales: Social Evolution in the Ocean. University of Chicago Press, Chicago, IL. 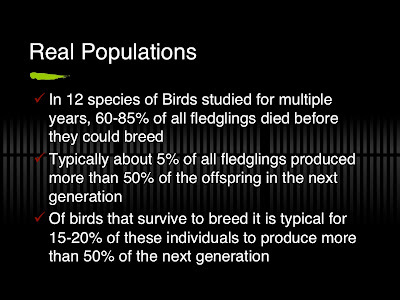 Slide 33: All studies of longterm success in birds and mammals show that there are only a few individuals that carry populations, and produce most of the surviving offspring who come to back to breed themselves. Source: Newton, I. 1989. 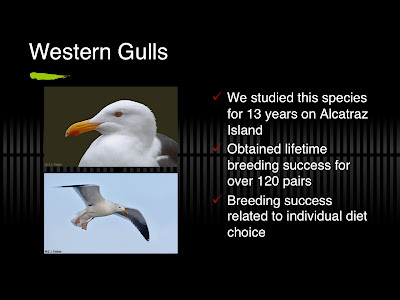 Lifetime Reproduction in Birds. Academic Press, New York, NY. 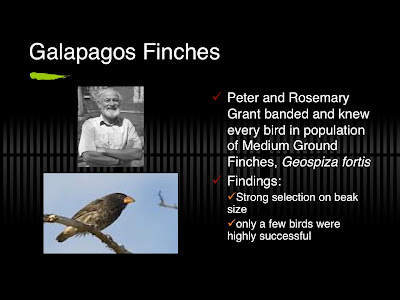 Slide 35: 124 pairs of which only 4 produced more than 25 chicks over 13 year period. 802 total chicks produced. 240 chicks produced by 10 pairs. 400 chicks (50%) produced by pairs that produced 15 or more chicks (20 of 124 pairs: 16%). Source: Annett, C.A. and R. Pierotti. 1999. 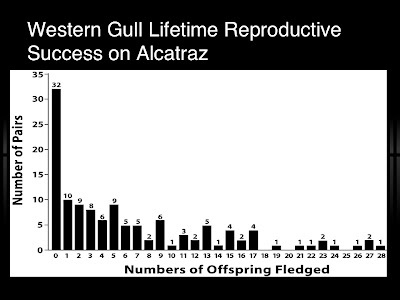 Longterm reproductive output and recruitment in western gulls: consequences of alternate foraging tactics. Ecology 80:288-297.